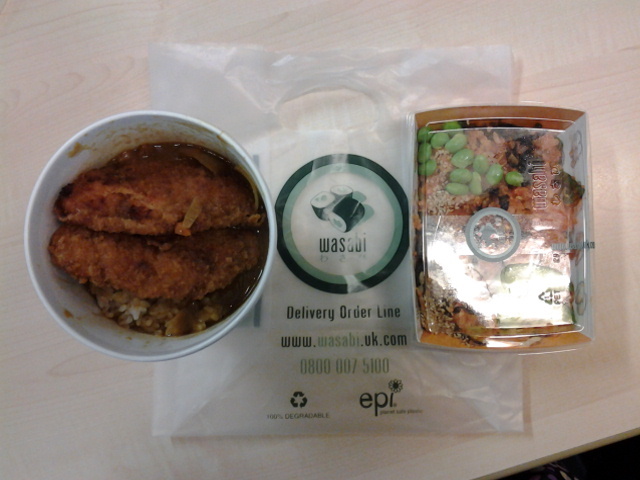 The inevitable has happened, I’m finally reviewing the Chicken Katsu Curry from Wasabi. It is not that I’m avoiding it or anything, it’s just there is always a queue at the Canary Wharf outlet and if I were to walk from Brick Lane to Liverpool Street, I’m better off getting something more interesting. 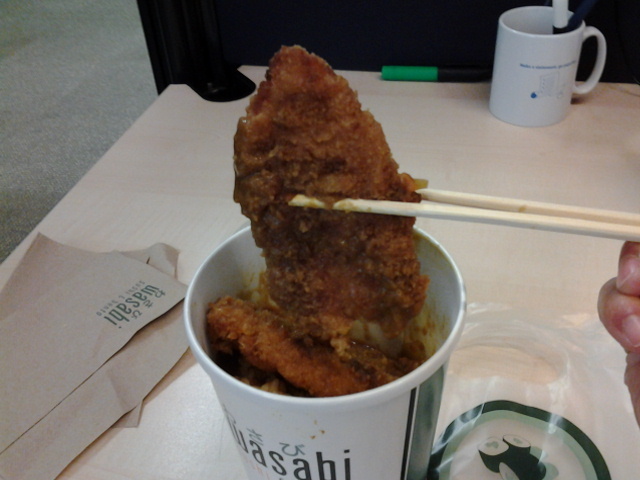 Yes, I think the Chicken Katsu Curry from Wasabi is “common”. Wasabi is one of the few Japanese fast food chain that has sprung up recently. Various types of sushi, bento boxes as well as a range of hot foods are available. The options on offer is dependent on which brand you visit. But I bet one of the best selling item on their menu is the Chicken Katsu Curry. The smell of the curry is irresitable. 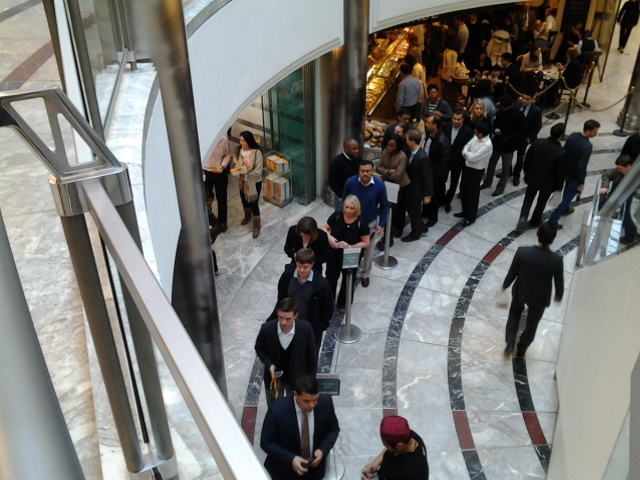 The problem with the Canary Wharf branch is that it is so damn crowded! 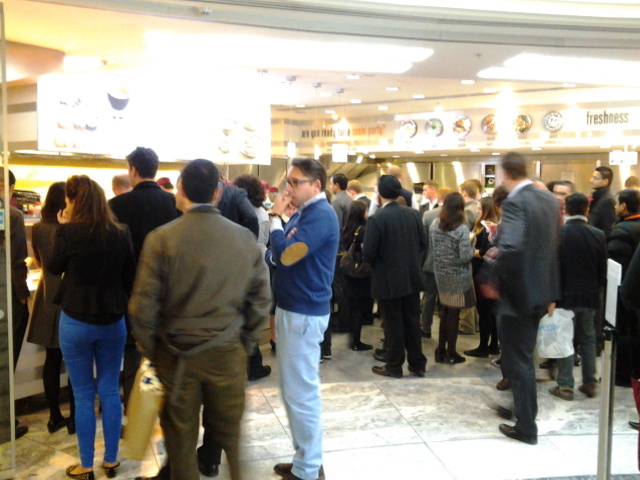 There are 2 queues, one for hot food while the other is for the sushi and bento boxes in the fridge area. Obviously the one for the hot food is the longer of the two. 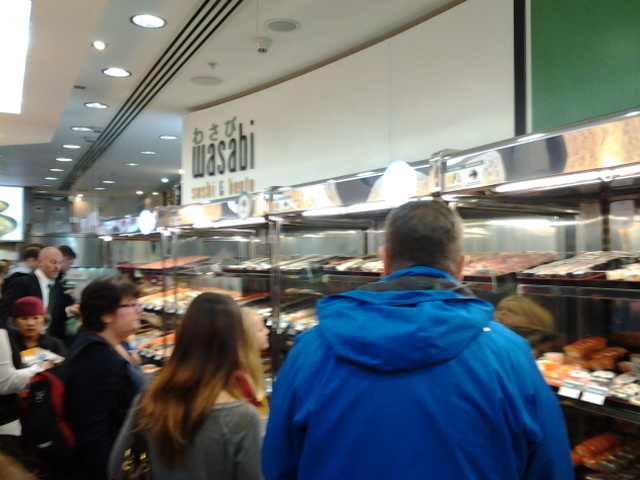 You don’t need to wait very long in the hot food queue as the staff at Wasabi are very efficient. They will take your order while you are still in the queue, give you a number and you proceed to pay at the counter. Then you have to mill around while waiting for your order to be ready. You only probabkly have to wait a couple of minutes but when you have 20-30 people milling around, things can get quite chaotic. Anyway, back to my lunch. 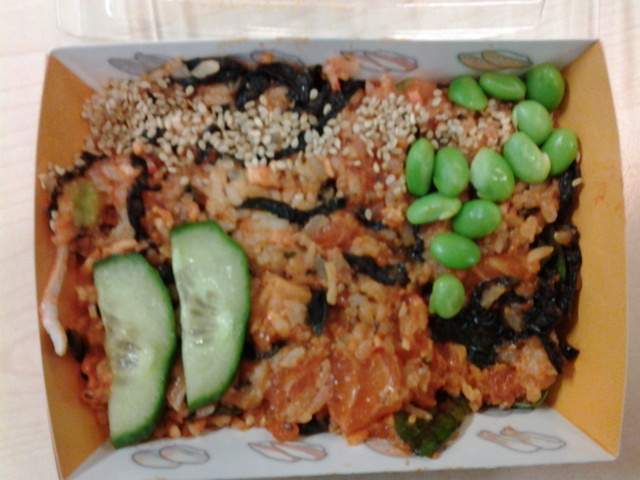 Apart from Chicken Katsu Curry which cost £5.45, I got the mini Spicy Chirashi Set which is £1.95. I’m always surprised why is the Chirashi so cheap? In most Japanese restaurants, the Chirashi Sushi is usually one of the more expensive rice bowls on the menu as it’s essentially mixed sashimi on rice. If you consider that the Chirashi is £1.95 while a Onigiri is £1.50, the Chirashi is a much better value. I have a cunning feeling that the Chirashi might be made with offcuts from making the sashimi and leftover rice? Having said that, it is delicious for what it is. Not sure whether I have tried the non-spicy version but the spicy one is pretty full on. If they could tone down the chilli sauce, I might be able to taste the fish better. 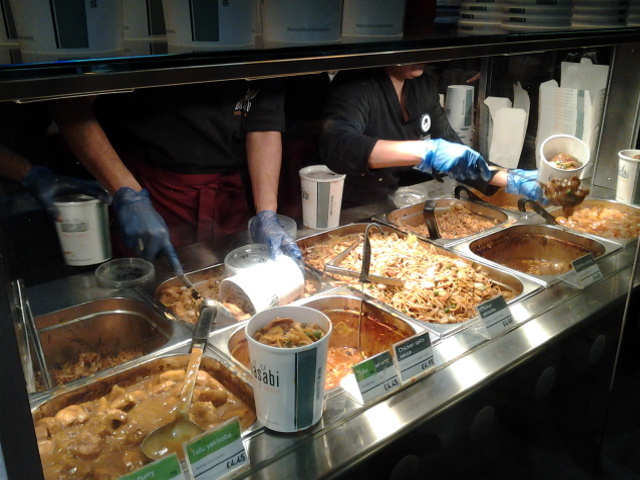 My advice to you, if you want to try Wasabi’s Chicken Katsu Curry, spare yourself the stress of queueing up at the Canary Wharf branch since there are so many other Wasabi outlets out there. This entry was posted in Asian, Japanese, Rice, Takeaway and tagged bento, Canary Wharf, chirashi sushi, katsu curry, Wasabi by junk4lunch. Bookmark the permalink.